Website Monitoring Services continuously monitor your websites for downtime and send email alerts as soon as your web server goes down or becomes slow and inaccessible. I recently did a small experiment to evaluate the reliability and response time of various website monitoring services available on the Internet. In case you are new, these services continuously monitor your website(s) for downtime and send email alerts as soon as your web server goes down or becomes slow and inaccessible. You get another alert when the site is up again. For this test, I configured my site with Uptime Party, Pingdom, Watch Mouse, Site Uptime and Zoho�s Site 24�7. They are all commercial site monitoring services but also offer a trial version which is good for around 30 days. Now as you would know, the site went down last week for a couple of hours due to some issues with the file server of the web hosting company but this was a good opportunity to test how quick and reliable these site monitoring services are. Here�s a snapshot of email alerts that came from all the above services along with the exact time when these alerts were received. As you may have noticed, Pingdom was able catch the downtime within seconds while Watch Mouse and Site Uptime were late by 5-10 minutes. 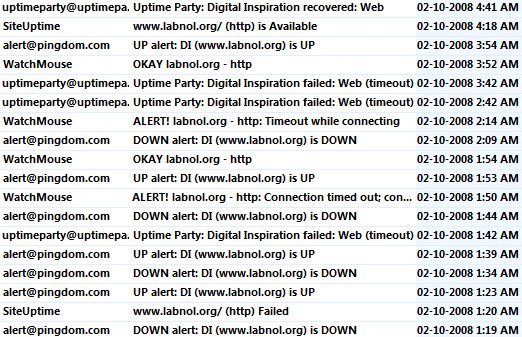 Uptime party sent a notification almost 30 minutes after the site went down. When the site was up and running again, Pingdom and WatchMouse were the first one to send an uptime email alert while the rest two were late by 10-15 minutes. The problem resurfaced yesterday night when the site went down and here�s a snapshot of email alerts from the second instance. Pingdom response time impressed again. I was not too sure why there were no email alerts from Site24�7 and it later turned out that site monitoring was disabled in the control panel. Have no clue why that happened so can�t really comment on Zoho�s service. Finally, here�s a quick chart comparing the price of various website monitoring services for bloggers and small web publishers.